This is the highest output, high-sensitivity, professional high-gain USB microphone available, and its the best choice for court reporters, musicians, students, business people, voice recognition purposes, Skype communication, VOIP and Podcasting anyone that needs to get high quality audio into computer! Included with this microphone is the Andrea Electronics driver, which includes very effective advanced, active noise cancellation processor activated with simple click of check-box! No difficult to setup adjustments! This is an important feature for Court Reporting and other business recording applications and only has to setup one time! Have you heard claims from other manufacturers that their mics are the best? Try this mic (and theirs if you like), and if you are not 100% convinced that this microphone produces stronger, clearer audio than any other microphone, we will gladly give you refund! This is the #1 choice for professional Court Reporters! Wondering why our microphone is $100 less than others claiming to be the best? So are we! In the past years, over 8000 Court Reporters in the USA have purchased Sound Professionals USB microphones (and all of our USB mics are made in the USA). Ask other professionals in your field they will tell you how good these microphones really are! Includes microphone jack for an extension mono or stereo microphones. If an extension microphone is plugged in, the sound from the external mic is blended (mixed in) with the built-in microphones. If you need an extension microphone with the same sound quality as the mics built into the USB mic, select one of the extension microphones in the option box above (SP-BOUNDARY or SP-BOUNDARY-2). These microphones are available with many different cable lengths. Optional USB extension cables available if you want to move the mic away from the computer, or if you want to attach the mic to the lid of laptop with Velcro (not supplied). Stereo Digital-to-Analog conversion provides hi-fidelity signals to powerful amplified output. Connector: 3.5 mm jack, left mic power and left audio on "tip", right mic power and right audio on "ring"
Power: USB Bus powered NO BATTERIES! Maximum Input Sound Level: 115 dB SPL, kHz at 1% T.H.D. PCs Windows 10, Windows 8x, Windows 7, Windows Vista, Windows XP, Windows 2000, Windows Me (Millennium), Windows 98 SE (Second Edition). Mac compatible also. 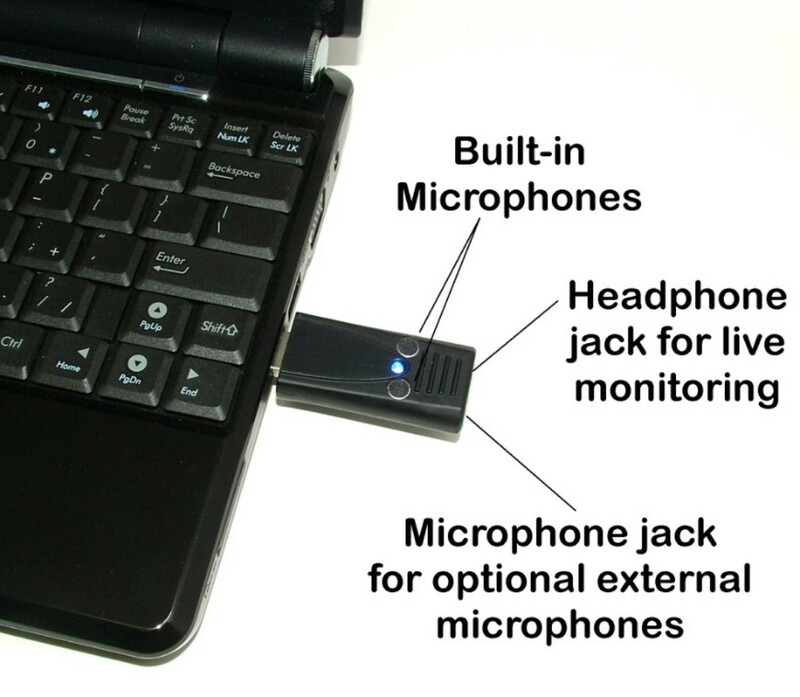 Note: This microphone plugs into USB port on computer, not into the PASSPORT, PASSPORT TOUCH, ELAN MIRA A3, FUSION STENTURA or other Stenographer machine. For mics that work with standard mic inputs, see this item.